Winter 2018, mild, mostly frozen, animals and people doing well. Above is one of the hogs exploring, and below are some of the cattle resting on their bedding pack, with hogs exploring at the left of the frame. I wrote that last week. Winter has decided to come back hard in February, with below zero wind chills and several inches of snow last night, February 3rd. Thank you to everyone who has purchased meat, or boxes, or halves, this winter. Your business is appreciated. I added several new products, (Brats-links and patties, Breakfast sausage patties, Cottage Bacon, Canadian Bacon, Ham Hocks). I also tweaked the Classic Pork boxes. Check them out and let me know if something interests you. I am farrowing several litters in one of the hoop barns with farrowing huts. The sows get to choose which hut to farrow in, and also make their own nest inside the huts. When it is this cold, I never have any trouble with a sow choosing to farrow outside of a hut, which can be a problem in the warmer months of the year. I haven’t lost many piglets, even though its been colder than I would prefer, (below 20 F). Except for one very big Landrace sow who chose to carry way too much bedding into her hut and farrowed on a very cold night. All her piglets died. My theory is whereas the other sows made a nest with at least a little room for the piglets to nurse, see photo below, this sow was so big with so much bedding, the piglets were simply unable to start nursing due to lack of room. December 18th, 2016, 4 pm. 3 degrees below zero Farenheit, 17 degrees below zero windchill. 8 week old piglets with their mothers. Pigs are resilient. I continue to be amazed at just how resilient. My background and education in the commodity swine industry tells me these piglets should just die in this environment, but I’ve always tried to be one who observes what is actually happening, rather than closing my eyes and “knowing” what should be happening. I have a hoop building cleaned and bedded with feed in the feeder. I’ve been trying to let the piglets self-wean for a few days, and even though they are going in the hoop building to eat feed, they prefer to spend their resting time with their mothers. I guess I’ll corral them one of these days to finish the weaning process. I started farrowing my spring group in early March. I’m using the same farrowing setup in the same hoop barn which I wrote about in my previous post. All I did was clean the manure out of the middle of the hoop barn, leaving the huts where they sat. As pigs generally don’t manure where they sleep, there was only bedding inside the huts and that is working fine. It doesn’t look like this group will average quite as well though, and I’ll tell you why. It’s gotten too warm. Today was in the 60s F. Instead of cold air keeping each litter in its own hut for a week to 10 days, the mama sows are calling their piglets out of the huts at just a few days old. The older litters are then robbing some of the milk from the younger litters and I fear it may starve some of the younger piglets. I had debated about whether I wanted to farrow in a hoop again, or place the huts out in the field. Well I’m glad I’ve kept them in the hut because we have still been having snowstorms and been dealing with mud. This group is almost finished. The May group will farrow out on pasture for sure. It’s been a long winter. As I write this on March 3rd, it’s 11 degrees below zero F. I’m tired. I’m back to hand-to-mouth wood cutting. Everyone who burns wood says they’ve burnt way more than normal. 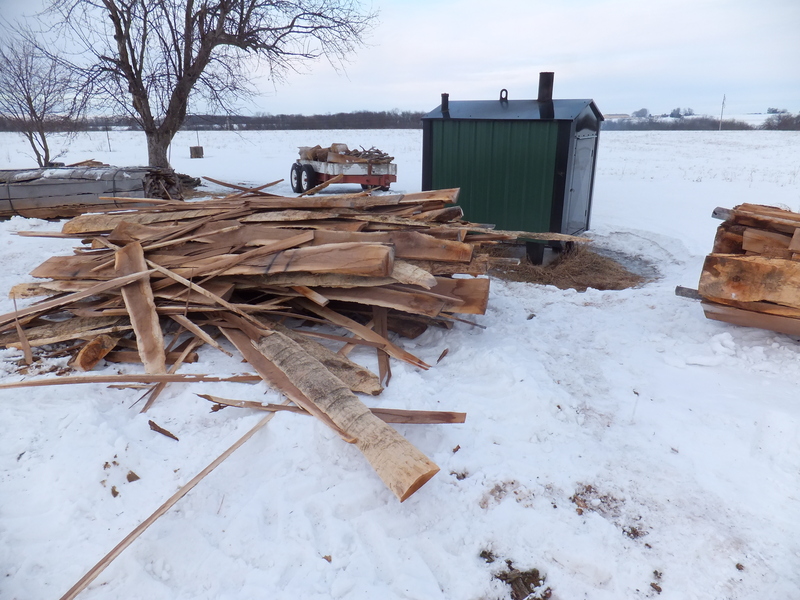 I need a bigger pile next year though, because the crusted snow in the woods makes it nearly impossible to drag in logs. In a bit of serendipity, I met an old schoolmate who burns wood also. I told him I had an outdoor wood burner. He’s right. I’ve finally realized that an outdoor wood burner is not a very efficient way to heat a house. However, it is a safe way to heat a house and I’m stuck with it for now. He told me about a lumber yard that sells scrap lumber for twenty bucks a bundle. They’re good-sized, eight to ten feet long, dry wood. He burns it in his burner. Not being a fast thinker, I had to let the idea germinate for a few days. 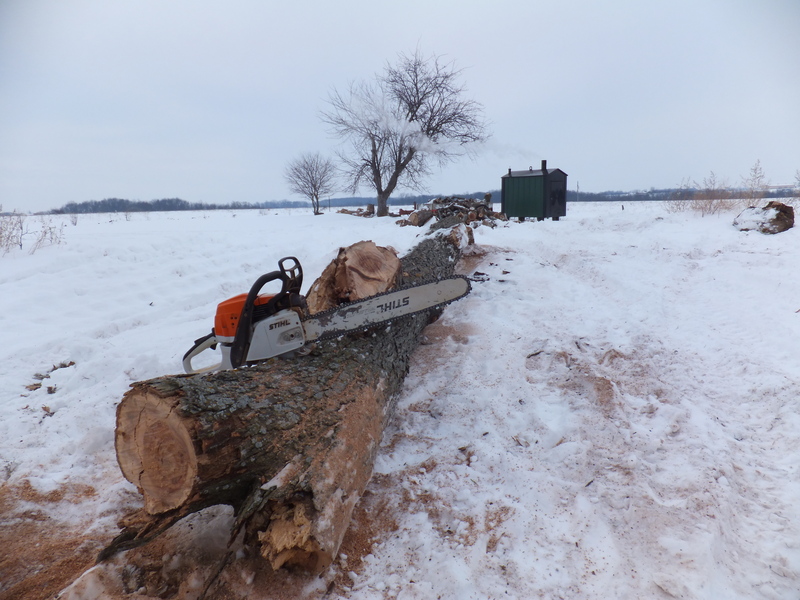 I think I gave myself permission to buy wood when I nearly got the tractor stuck for the umpteenth time. I called him up and asked him to bring me a load and he delivered eight bundles. 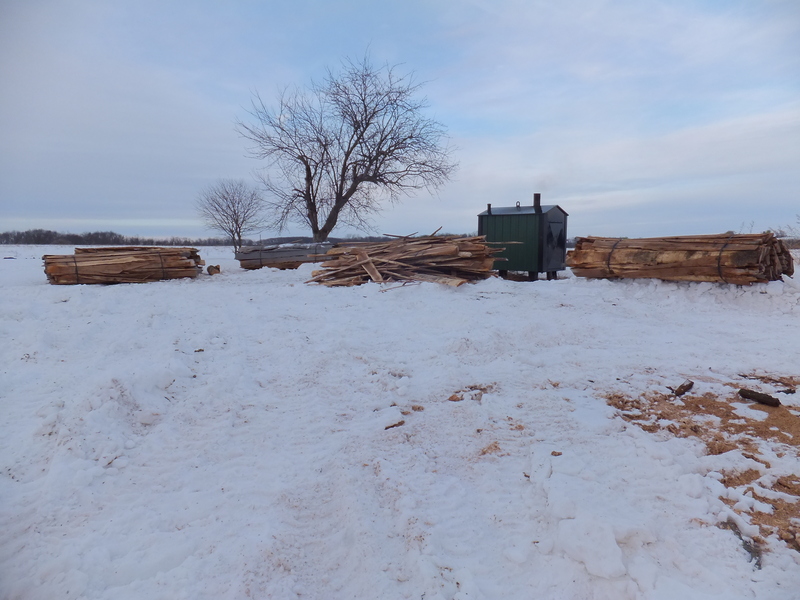 If I’m not reading the calendar wrong, that should be enough wood to get me to the point where it’s hot enough I’m forgetting how cold it’s been! Restrictive, but warm! I normally wear something like the ensemble pictured below. But when the temps drop below zero F, I throw on these insulated bibs and am able to get my chores done without discomfort. 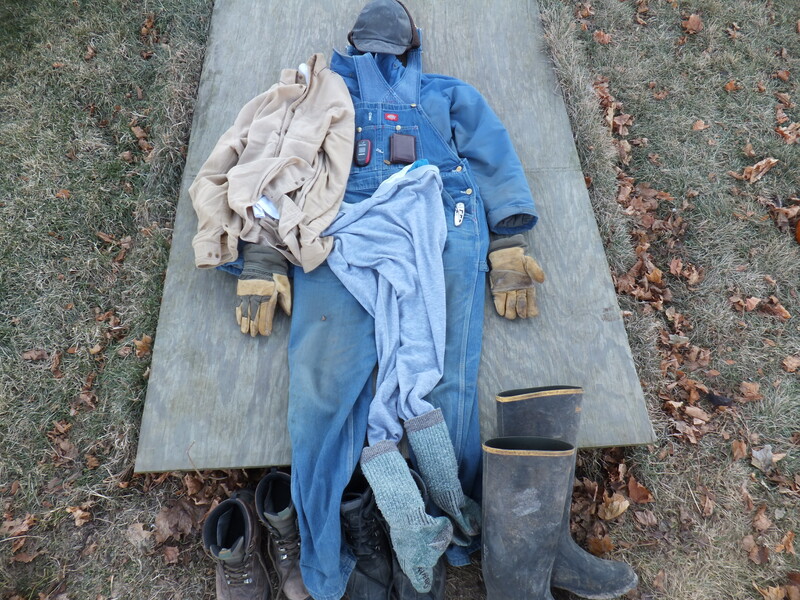 My Dad is a big fan of insulated coveralls. He usually puts them on in October and doesn’t take them off until May. But I’ve found them too restrictive. I like to move when I’m outside. That being said, I was too cold when the weather turned brutal. 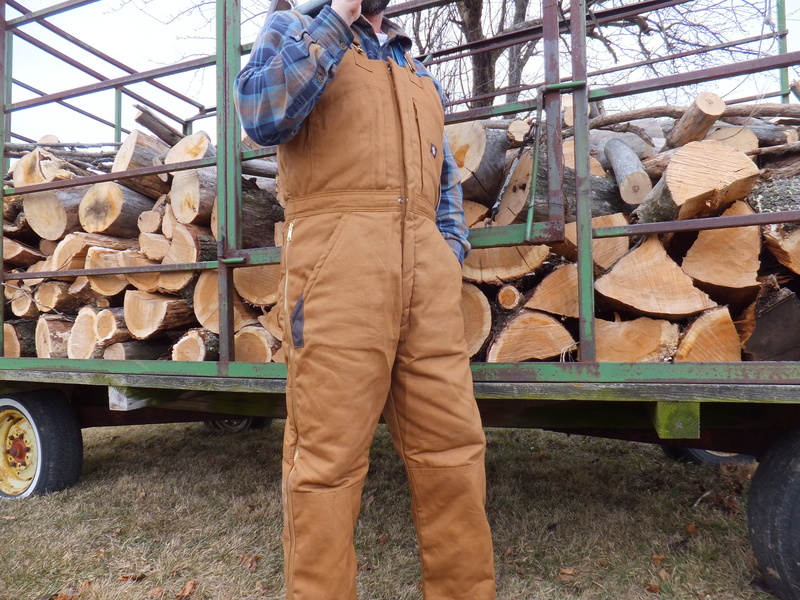 So when Country Outfitters offered me clothes for free, I jumped at the chance to try these insulated bibs. And I learned something. I used to think when my toes and fingers got cold I had a cold toes and fingers problem. So I would put on a second pair of socks and gloves to combat the problem with limited success. Now I see when I put on these insulated bibs, it ties everything together and warms up my core. This warmth radiates to my toes and fingers and I don’t need more socks or gloves. Amazing! I’ve never liked evergreens. I think it’s because I distrust their green when the rest of the world is white and brown. Something about their green is off, even in August when this photo was taken. 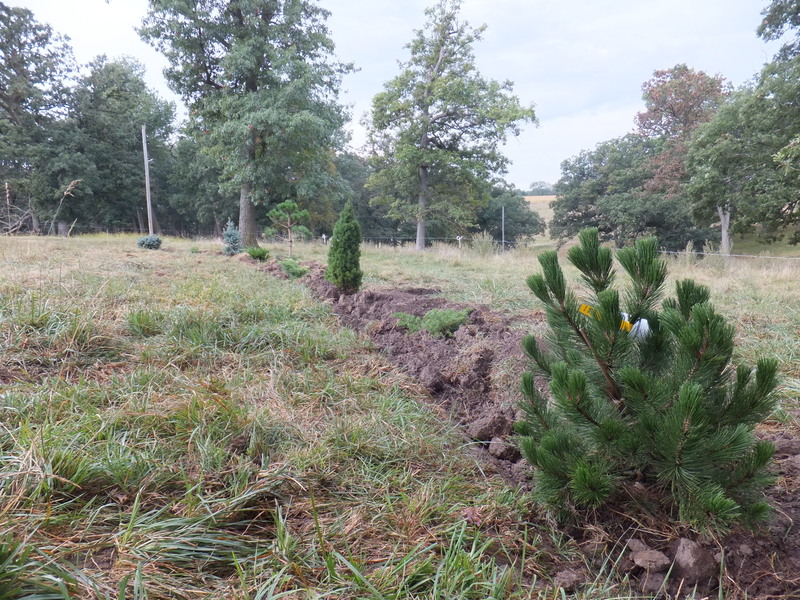 That being said, I planted this small windbreak late last summer when they were purchased for the corner of our yard. I read the tags before planting and realized they need more space. So I recommisoned them for a small windbreak in the pasture. Fast-forward to now and we’ve been experiencing one of the worst winters in memory, with arctic blasts of wind dropping the windchill well below zero for days. I feel more exposed on top of this hill and am thinking I need more windbreaks. So I ordered 25 Colorada Blue Spruce from our county agency and may double or triple the order before this winter is through. I had great expectations to improve over 2012’s average weaned per litter of 7.8 piglets. 8 piglets weaned per litter isn’t much of an improvement, but I’ll take it, especially considering the way 2013 farrowing started in a blizzard. But an average of 8 doesn’t tell the full story as this is a tale of two seasons, difficult spring and easy summer. 2012 was difficult because we started farrowing in January in a hoop barn and lost several piglets when the temperature dropped below zero F. I thought I could avoid that problem in 2013 by waiting until March to start farrowing. March 2012 was 80 F and dry, a bad precursor to the drought which would follow, but ideal weather for farrowing. March 2013 was the opposite, cold and wet, snow, rain, plummeting temps. I had an idea about how much bedding would be needed in each farrowing hut. Boy was I wrong. I didn’t think about the ground under the hut being frozen, so it was extremely cold for the pigs and when the body heat of the sow warmed the ground it became wet. The first two sows farrowed and 17 of the first 22 piglets froze. I felt desperate and depressed. Well, I remembered what Professor Freeman taught me. Environmental factors are greater for plants than animals for a simple reason: animals can move, animals can modify their environment. I knew the sows’ instinct to save their piglets was strong, I just needed to give them a chance. So I started buying truckloads of wood shavings. I had them slide whole pallets of bagged wood shavings into the back of my trailer. I trudged through the snow with a bag on my shoulder and started with two bags for each hut to soak up the wet and cold. And the sows responded, making dry nests for their piglets. 17 spring litters farrowed 193 live piglets for an average of 11.4 per litter. They weaned 119 piglets, an average of 7 piglets per litter. So the preweaning mortality was 38.3%. Considering how badly they started, I considered it a success to save only 2 out of every 3 piglets born alive. I let the sows have a long lactation and then weaned all the piglets at once. Since I didn’t have enough boar power to breed 17 sows, I decided to artificially inseminate, AI. I was successful the previous fall with AI, settling nearly all the sows, which resulted in these spring litters. But the spring was a different story as some of the sows had already started cycling and I was busy with spring work, spending not nearly enough time watching for signs of estrus. I got exactly 0% of the sows settled with AI. At this point, I think anyone would say I was in a major swine-farming slump. A beginning farmer may be thinking swine-farming is not for them. But my years of experience has taught me that perseverance is what is required, and since I’m my own boss no one gets to decide I fail except for me. Luckily I had some young boars and gilts which could be used for breeding. So I put the boars in with the gilts and sold the sows as culls. The gilts farrowed in July, August, and September. The first gilt had 14 weak piglets with all but 5 dying quickly and I thought, “oh no, my slump continues,” but thankfully, the next litters were strong and healthy. The weather was warm and dry. Many of the gilts farrowed in huts, but some picked their own spots in the woods. I used very little bedding and did very little work. It was a joy to experience. 15 gilts farrowed 158 live piglets for an average of 10.5 per litter. They weaned 138 piglets for an average of 9.2 per litter. The preweaning mortality on this group was only 12.7%. The final statistics are 32 sows and gilts farrowed 351 live piglets for an average of 11 per litter. They weaned 257 piglets for an average of 8 piglets per litter. Preweaning mortality averaged 27%. I’m modifying again for 2014. Sows will start farrowing at the end of February. I plan on putting huts into a bedded hoop barn and farrowing there for the spring litters. For the summer litters I’ll continue to just stand back and let them do their thing. You are currently browsing the archives for the Curious weather category.